Remember the new Ford Ranger pickup truck? Of course you do. You probably clicked on this article to drop “Why don’t they sell it in America?” into the comments. One of the reasons I’ve heard is “it’s too close in size to the F-150” but you never really see both trucks in the same place. Now you can. Ford Ranger production was discontinued for the U.S. market in 2012, but a whole new bodystyle was introduced around the same time for just about every other country on Earth. That third-generation Ranger is sold in many markets today. 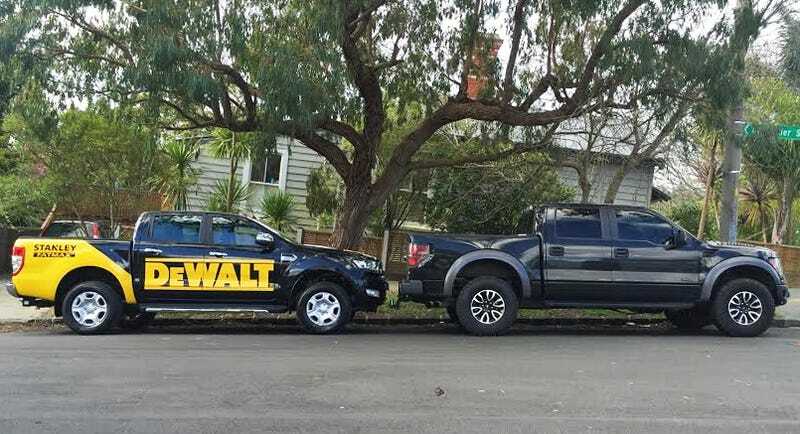 Reader Michael M. in New Zealand spotted both Ford’s four-door pickups on the street and I thought it was a unique opportunity to see the two compared in real life. I don’t think I’ve ever actually seen the trucks together before. You can read the specifications of any truck online and see that today’s four-door F-150 is almost two feet longer than the current four-door Ranger, with about a foot and a half more wheelbase. Does that look apparent to you in the picture or would you guess they’re closer? The Ford Raptor in this image is now that of the previous-generation F-150 bodystyle, but the difference between that and the current truck is pretty slim. Ford lists the 2016 four-door truck’s wheelbase at 145 inches and total length at 231.9 inches. We did a big breakdown of midsize truck dimensions when the new Chevy Colorado came out last year, but real images tend to be more interesting than spreadsheets so I thought the comparison was worth revisiting, even if it leaves my own impressions unchanged. Could these two trucks ever directly co-exist or what?